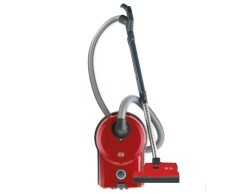 The SEBO Automatic X4 wasn’t made to be like other vacuums. The X4 was designed, crafted, and engineered for superior performance and ease of use. Every piece fits together to allow this vacuum cleaner to operate optimally. This means that if for any reason you or someone using the vacuum forgot to replace the hose, or filter, or bag properly, the vacuum remains off to avoid catastrophic results. In short, this vacuum is child proof. SEBO takes the protection policy many steps further with a five (5) year manufacturer’s warranty all parts and labor, down to the last screw. The X4 also features a lifetime warranty on the belt; that is to say, SEBO is confident enough that the belt will never break, therefore the company offers that warranty to ensure customer satisfaction. As stated, the SEBO X4 is engineered for easy usage for many years. One integral feature that sets this model apart from competitors is the automatic height adjustment. When switching from bare floor to carpet or rug, the unit will lift or lower itself for maximum airflow and suction to remove dirt and debris from the surface. The brushroll acts as the sensor for this ingenious design element; when the floor brush is either not making enough contact with the surface or it is hitting the floor too vigorously, it will adjust the height to resolve the issue. For those with allergies or fear dust lingering in the air after vacuuming, the Automatic X4 has you covered. SEBO crafts this model to meet “hospital-grade” filtration, capturing 99.97% of all air pollutants. The X4 achieves this filtration thanks to a sealant strip on the bottom to negate kick-back dust; sealant around the bag door; electrostatic S-class filter; the top fill bag system; and the statically charged bags to attract and cling dust to the sides. No crack will be found in the body as it is comprised of the same plastic as football helmets. With all of the benefits mentioned above as well as full sized, on-board tools, the SEBO X4 boasts a low cost of ownership. Replacement bags and filters range reasonably, and the vacuum is backed by a five year warranty on all parts and labor. 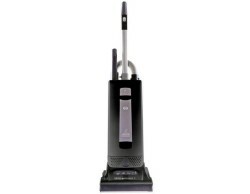 The SEBO Automatic X4 vacuum cleaner stands as creative engineering brilliance and performance. Surprising to most, all of the features have been unique to the X4 since 1991. The vacuum continues to weather the tests of time and it will power on for the coming years.